The Piedmont Chapter of the Sons of the American Revolution (SAR) supports the Boy Scouts of America through it's Eagle Scout program as well as having members who are qualified merit badge counselors for American Heritage, Citizenship in the Nation and Genealogy. When a Scout has earned the rank of Eagle Scout, the Chapter will recognize the Scout by presenting the Scout with a Certificate of Achievement. This Certificate can be presented to the Scout at the Court of Honor ceremony by a member of the Piedmont Chapter. To request a Certificate of Achievement, contact the Piedmont Chapter Eagle Scout Committee Chairman. Please provide, the full name of the Scout, the unit number, the date of the Eagle Court of Honor and the name and contact information for the Scoutmaster or Troop Advancement Coordinator. Contact information for the Chapter Chairman is at the bottom of the page. In addition to this, the SAR invites all Eagle Scouts (under 19 years of age) to participate in the Arthur M. & Berdena King Eagle Scout Award program. Scouts enter this contest at the local SAR Chapter level through the Piedmont Chapter. If they are recognized as the overall winner, they advance to the Georgia Society SAR contest level. If they are the overall winner at State, they are eligible to enter the National SAR Eagle Scout Award contest. While the preliminary rounds of the contest begin at the local level, Scouts may eventually advance to the state or national levels, eventually held in June during the annual SAR Congress, and awarded up to $10,000. College plans do not have to be completed in order to receive the cash award. Scouts may apply more than one year if he meets the age requirements, but no more than $10,000 total may be granted to any one Eagle Scout. The competition is conducted in three phases: the local chapter, state-level society, and national phases. Applicants may not enter at the national level. Contest entrants need complete only one application for the SAR chapter-level competition. Please include original themed essay on separate pages and attach with this form. The applicant should list the total number of words at the bottom of the page. Please note that the words "a" and "the" do not count towards the 500-word maximum. Please put the applicant's name at the top of each supplemental page. A bibliography is required, but not included in the final word count. The applicant must show references for any quotations used and historical facts cited. 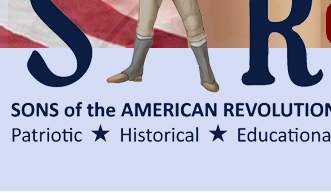 A description of sample essay topics, which must be related to the Revolutionary War period, is found on the Four - Generation Ancestry Chart. The Contest Chairmen can answer any questions, provide you with additional information and assist you in completing the forms. Their contact info is at the bottom of the page. The submission deadline for Chapter applications is December 15th. Scholarship Award and an Eagle Scholarship Medal. This winner is invited as a guest, with parents or guardian, to the Annual Chapter Awards Banquet. Overall applicants, not per Troop. The Georgia Society submission deadline for applications is December 31. Award and Eagle Scout trophy to the State Society winner. The submission deadline for State applications is February 15th.